This powerful (167 nanosecond instruction execution) yet easy-to-program (only 35 single word instructions) CMOS OTP-based 8-bit microcontroller packs Microchip's powerful PIC® architecture into a 28-pin package. 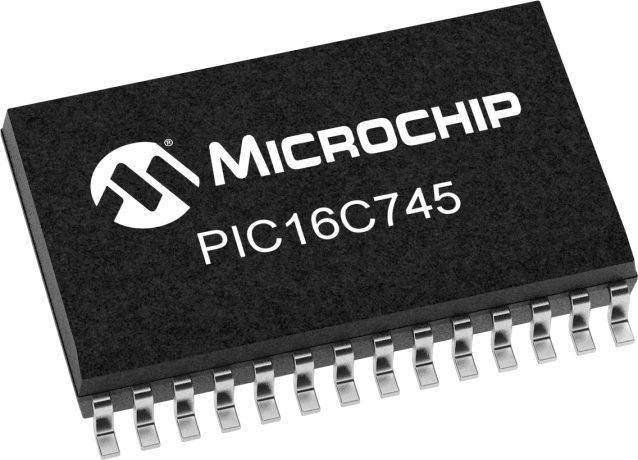 The PIC16C745 supports and is certified for the USB standard 1.1 for Low Speed communication. In addition, there are 5 channels of 8 -bit Analog-to-Digital converters and a Universal Asynchronous Receiver Transmitter (USART) which is also known as the Serial Communication Interface (SCI). Easily adapted for PC related peripherals, as well as UPS, joysticks and medical applications.